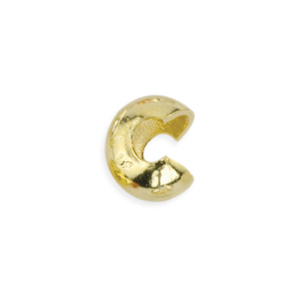 Bring an accent of shine to your jewelry designs with this crimp cover. Crimp covers are great for camouflaging crimp tubes while adding a touch of style to your projects. This one will cover crimps that are up to 2x2mm in size. It will hide your crimp tube and make it look like another bead on the strand, creating a professional finishing touch. It will also prevent snagging in your jewelry designs. This crimp cover is open on one side, allowing you to slip it over your crimp tube. Simply close with chain or flat nose pliers. Available in Gold and Silver plate, 144pc/pack.